Every home remodelling project has a cost, and getting a tradie to do professional bathroom renovations will definitely keep the room more functional and aesthetically impressive. Whether the need to renovate is urgent or you just want to improve the overall look of your bathroom, it’s undeniably important to look at some benefits that you can enjoy long-term. So how do you – and your home – take advantage of a professional bathroom renovation? More than just cleaning and deodorising the room, renovating the bathroom improves its functionality. It’s no secret that germs, stains and moulds can turn a good-looking bathroom into a dingy, unappealing place. More so, shattered floor tiles, broken shower heads and old toilet basins signal the need of a professional bathroom remodelling. Paying attention to usage is more realistic than focusing on the design since you’ll be needing more of its function whenever you’re in it. That’s not to say that aesthetics shouldn’t be invested upon especially if you’re on a budget. You just have to carefully weigh your priorities to ensure you are spending your resources right. 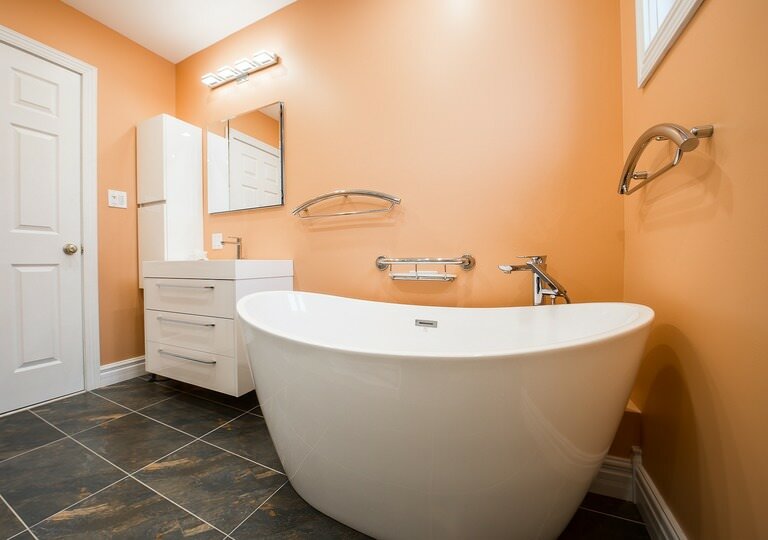 Having a beautifully renovated bathroom also helps in boosting up your property value. So whether it’s a full-fledged or partial renovation, go for what you think is best for your bathroom space. Not only does a marred tiling floor become a nuisance but it also carries a potential hazard. Unless you supervise or work for a professional bathroom remodelling business in town, you wouldn’t want to perform DIY repairs or enhancements in this room. While a simple task like fixing the faucet is doable, it’s safe to have someone to look for and identify some possible issues that might be hazardous or detrimental if left unresolved. It can also be the best time to deal with the common problems (e.g. faulty installation, low-quality supplies) done before the renovation takes place. Replacing damaging features with a new one can keep you (and your family) from getting into accidents so you better be taking professional renovations seriously before it puts your life at risk. Less power consumption means less costs. If thinking about the amount of money that you need to spend for professional bathroom renovations puts pressure on you, why not try to concentrate on possible returns that you can gain from your investment? According to a report released by the Housing Industry Association (HIA) in 2015, the average cost for professional bathroom renovations was $17,779. Also, the common range of prices can be as low as $5,000 for a budgeted figure and as high as $50,000+ for luxury renovations. While the corresponding costs for a professional bathroom remodelling may vary depending on the size of the room, quality of materials, plumbing and electrical fixtures, and many others, it’s interesting to consider what you can gain afterward. Would you believe that you can save around $1.5 billion worth of power especially if you’re going to invest in energy-efficient solutions for your lighting features, water heaters, toilets, etc? So instead of looking at the negative aspects, see how you can contribute to saving most of the environmental resources. Nothing is cosier than having to move freely and comfortably when using one of the busiest areas of your house. Professional bathroom renovations often become a solution for small or cramped bathrooms. You also have the option to expand the area if you’re doing a major restructuring, giving you more opportunities to add more features that help enhance both the functionality and design of the bathroom. Countertops with storage drawers or lockers only require a minimal space so you may want to consider this to make the most of your professional bathroom renovations. Professional bathroom renovations can also help to increase your comfort levels and enjoyment amidst the time and money invested. Having added all your preferred features (cabinets, mirrors, vanity plumbing, etc) into it makes it more personally rewarding. Buying a new tub, for instance, can help change the entire visual aspect of your bathroom. Other awesome ideas (if you’re up for a professional bathroom remodelling that’ll cost higher) include adding multiple shower heads. Professional bathroom renovations aren’t just about spending but gaining in the long run. Make sure to contact your professional bathroom remodelling experts and see what they can do for your bathroom.